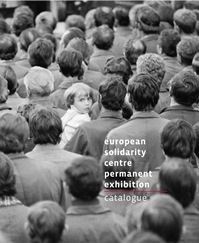 The catalogue includes the description and pictures of the history that visitors will find during their journey through seven halls of the European Solidarity Centre’s permanent exhibition–a modern, multimedia display devoted to Solidarity’s revolution and the collapse of the Soviet bloc. It is one of Poland’s biggest narrative exhibitions taking up the recent history of Poland and Europe. The display is approaching the phenomenon and originality of the Solidarity movement in an interesting way comprehensible to a variety of audiences: witnesses and participants of the depicted events, foreign guests, people from the younger generations, and even children. The basic narrative consists of historical storytelling which reconstructs the dynamic process in its numerous dimensions: political, social and cultural. This foundation allows us to convey the history of a universal idea that found a new expression in Solidarity. Visitors will learn how the revolution proceeded in Poland and Central and Eastern Europe.